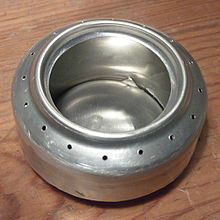 A beverage-can stove, or pop-can stove, is a do it yourself, ultralight, alcohol-burning portable stove. The simple design is made entirely from aluminium cans, lending itself to countless variations. Total weight, including a windscreen/stand, can be less than one ounce (28 g). The design is popular in ultralight backpacking due to its low cost and lighter weight than commercial stoves. This advantage may be lost on long hiking trips, where a lot of fuel is packed, since alcohol has less energy per weight than some other stove fuels. Of the available fuels, methanol delivers the least energy, isopropyl alcohol delivers more, butanol is hardly ever used, and pure ethanol the most. Denatured alcohol can contain various mixtures of ethanol, other alcohols, and other chemicals. All but isopropyl alcohol burn with a smokeless flame; it can provide both light and heat. The basic design dates back more than a century. It consists of a double-wall gas generator, a perforated burner ring, and an inner preheat chamber. A similar design was patented in 1904 by New York coppersmith J. Heinrichs. Trangia has been selling a commercial version of the design since 1925, and Safesport marketed a stainless-steel stove in the 1990s. The Trangia stove burner is made from brass, although all the other associated parts that come with it are aluminium. In the unpressurized open-top design the double wall acts as a gas generator, transferring heat from the flame to the fuel. This effect enhances combustion, producing more heat than other passive designs. The inner wall also creates a convenient preheat chamber for starting the stove. Once the fuel has warmed up, its vapor will travel up the hollow wall, pass through the perforations, and form a ring of flame. This improves air/fuel mixing and therefore combustion. Vapor also rises from the center of the stove and burns when passing through the ring of flame as long as a pot is over the stove. Pressurized designs have no cut-out in the top. They are filled with alcohol by separating the two halves of the burner, by opening a plug to a smaller hole in the center of the top side or by filling through the gas-jet holes. A wick may be inserted into the hollow wall, where it will draw fuel upwards closer to the hot parts of the burner. Evaporating fuel from the wick removes heat from the top parts of the burner and subsequently the fuel at the bottom receives less heat. This slows down evaporation through the center while increasing the gas pressure inside the wall, spreading the ring of flame outwards, inwards, or vertically depending on the jet directions, while the center of the burner produces almost no flame, leading to a more controlled burn and faster starting. Suitable wick materials include fiberglass or cotton cloth. The wick will not burn because the evaporating fuel keeps it cool; also the pressure inside prevents oxygen from entering the hollow until the burner can no longer produce enough gas to support a flame. Cellulose cigarette filters wick fuel efficiently upwards but melt and burn in all but the least powerful designs. Other wick materials in use are Kevlar and other aramid fibers, carbon felt, fiberglass, and even toilet paper. Fuel is poured into the stove and ignited, burning in the center. Three-piece beverage-can stove (exploded view). The stove is made from two aluminium can bottoms. An inner wall is cut and rolled from the can material. A ring of holes is pierced into the top with a pin. Parts can be glued with silicone sealant, high-temperature epoxy, or sealed with aluminum (thermal) foil tape, although this is not necessary. Total height is less than two inches (50 mm), though dimensions may be increased to hold more fuel or decreased to take up even less space. The choice of aluminium has several advantages—light weight, low cost, and good thermal conductivity to aid vaporization of fuel. Modifications to the surface such as inking or painting a dark color increase the amount of radiant thermal energy captured by the stove body and change the stove's burn profile as a function of time, fuel load, and ambient temperature. Many designs require priming to get started and most are regenerative and stable during operation. Alternative construction materials have been used, including stoves made of tin cans such as cat food tins, tuna cans, and juice cans — the basic design is very similar. Windscreens/stands can be fabricated from tin cans, cut to size with ventilation holes added. Steel beverage cans of the classic 12 ounces design are still in limited use and while they are heat resistant, their coating will burn off and they will rust if not cared for. Each stove works well to supply one or two people. When used to cook larger meals (greater than 2 cups (0.5 litres)), it is less efficient than a more-powerful stove which delivers more heat to a pot. This is because a longer time is required to reach the boiling temperature, during which more heat is lost to the surroundings. To use the stove, a small amount of fuel is poured into the stove and ignited. The pot is then placed above the stove, on a windscreen or stand. The flame is small at first, only burning from the inner chamber. Once the fuel has warmed up (requiring about one minute) its vapor will pass through the perforations and form a ring of flame. Enough heat from the flame is passed to the fuel to maintain full combustion until the fuel runs out. Boil times can be significantly reduced by using a pot of the appropriate diameter (to reduce heat loss on the sides of the pot) and especially by a wind screen which maximizes efficiency. Time to boil 2 cups (500 ml): ~5 minutes at 6500 ft (2000m) altitude with ambient temp of ~45F (7C) and water temp of ~55F (13C). The stove can outperform some commercial models in cold or high-altitude environments, where propane and butane canisters might fail. Roland Mueser, in Long-Distance Hiking, surveyed hikers on the Appalachian Trail and found that this stove was the only design with a zero-percent failure rate. Fuel usage (by weight) is about fifty percent greater than a butane/propane stove. Can stoves weigh less than an ounce, compared with three ounces for the lightest gas stoves. Many commercial stoves also require special fuel canisters, adding to overall stove weight. No such canisters are necessary in a can stove; denatured alcohol can be carried in virtually any lightweight container, such as a plastic soda bottle. The weight advantage of the beverage-can stove is diminished by the greater fuel consumption (especially on longer hikes), but may still be offset by its reliability and simplicity. Other attributes of the beverage-can stove are its nearly silent operation and its suitability as an emergency backup. Denatured alcohol is a (relatively) environmentally-friendly fuel that does not leave a residue or soot. Denatured alcohol is commonly available at camping outfitters and hardware stores. Denatured alcohol is toxic to drink. Non-toxic pure ethanol is rarely used as stove fuel in the United States, since it is usually subject to a liquor tax. However it also has some medicinal use in treating stings and bites, as a coolant, and antiseptic. These stoves operate marginally on 90% isopropyl alcohol, poorly on 70% and not at all with 50%. Water typically cannot be boiled with isopropyl rubbing alcohol, but if the more rarely found (still inexpensive) laboratory grade or "gas drier" is used, and the sooting is dealt with by applying a little soap solution to the pot, the fuel value of the alcohol will reduce boiling times, not increase them. Beverage-can stove variations with cross sections in yellow. From left to right—standard design; inverted two-piece; side-burner; pressurized. A side-burner stove built from a single can as part of a Scouting project. Alcohol stoves are inherently dangerous, since spilling is possible and the fuel burns with a nearly invisible flame. If a spill occurs the best course of action often is to step back and let the alcohol burn up. A stove with a deep well is wind and blow-out resistant — blowing into it can send burning alcohol flying. A stove with a small, shallow well, or a central wick may or may not be blown out to stop it from burning. A safe and lightweight snuff cap or simmer ring is added to some stove designs. Yet alcohol remains safer than most camping fuels. An alcohol fire can be extinguished with plain water, and alcohol fumes are non-explosive. Fuel must never be added when the flame is still burning. The Trangia fuel bottles do not automatically shut off, nor do they prevent flashback. While the valve does close if released, human reflex is not fast enough to release the valve if flashback occurs. The Boy Scouts of America prohibits "equipment that is handcrafted . . . due to legal concerns. Examples include alcohol-burning 'can' stoves . . . ." The nearly invisible flame and the risk of spilling burning fuel can cause burns. ^ "Energy Content of Fuels". galileo.phys.virginia.edu. ^ Robinson, Roy. "The Cat Food Can Alcohol Stove". Retrieved on March 17, 2007. ^ "Yet Another Alcohol Stove". ^ "Build a Better Windscreen". Sgt Rock's Hiking H.Q. Retrieved 20 March 2013. ^ "Weight comparison of beverage-can stoves vs. some commercial stoves"
^ "Policy on the Storage, Handling, and Use of Chemical Fuels and Equipment". National Council, Boy Scouts of America. Boy Scouts of America. December 2009. Archived from the original (PDF) on 6 July 2015. Retrieved 5 July 2015. Equipment that is handcrafted, homemade, modified, or installed beyond the manufacturer’s stated design limitations or use. Examples include alcohol-burning 'can' stoves, smudge pots, improperly installed heaters, and propane burners with their regulators removed. Wikimedia Commons has media related to Beverage can stoves. This page was last edited on 26 October 2018, at 19:02 (UTC).